Airbrasive® was originally a division of S.S. White, now Airbrasive® Jet Technologies. S.S. White Technologies, Inc. started life in Philadelphia some 162 years ago as a tooth factory founded by Dr. Samuel Stockton White in 1844 with a work force of three. In 1844 young Samuel set up his own tooth factory in the attic of a house in downtown Philadelphia and practiced dentistry downstairs. 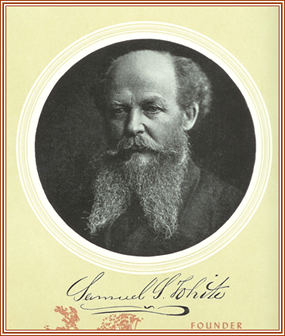 Samuel Stockton White’s little tooth factory became, over the decades, the largest dental manufacturing company in the world–with sales offices in New York, Boston and Chicago; and catalogues in Spanish, French and German. Dr. White was a visionary and a tireless inventor with ten patents to his name. In 1874 Dr. Eli Starr first introduced high speed Flexible Shaft in S.S. White dental engines. He obtained US Patent No. 158,325 in 1874 for his invention. It was so successful that Dr. White continued to buy patents for further improvements in Flexible Shaft thereafter. He encouraged fellow dentists to improve their practices which created a market for tools and supplies he manufactured and sold. The company continued to flourish after Dr. White’s death under a series of strong and creative managers. Airbrasive® began to invent the Micro-Blaster to remove unwanted burrs and other materials that were not needed or required. In the late 1940’s our engineers developed the first Micro-Blasters. The initial Micro-Blaster was demonstrated and a patent was issued in 1950. The Airbrasive® machines proved so effective in saving time and money in so many applications that we built an entire business around it. The Airbrasive® machine is well known as the highest unit of its kind on the market and the industry standard. In fact, many Airbrasive® machines purchased over 25 years ago are still in use and working as well as the day they were put in operation. Over the years Airbrasive® continued to develop better and better Micro-Blasters. Airbrasive® currently holds 27 patents for its design and manufacture. Nozzles and powders were developed to allow a wide range of needs to solve our client’s needs. Airbrasive’s® powder was developed to specifically work in the Micro-Blaster.